See the Tully Lake website for additional information. Primary recreational opportunities are listed below. Directions: Tully Lake is located in north central Massachusetts, about 1.5 hours west of Boston. In Massachusetts, take exit 17 on Route 2, and follow Route 32 north approximately 6 miles through Athol and into Royalston. From New Hampshire, follow Route 32 south about 8 miles from the intersection of Route 119 in Richmond. Route 32 goes over Tully Dam and provides direct access to the lake. Factoid: Tully Lake is a 1300-acre flood control project completed in 1949. The reservoir area is rich with natural beauty and outdoor recreation. A tents-only campground with 35 sites lies on the north side of the 200-acre lake. Adjacent to the dam, the Recreation Area offers picnic sites and a boat ramp with a 10-HP maximum. Twenty-three miles of hiking trails extend around the lake, Long Pond, and off-site to nearby waterfalls and scenic vistas. 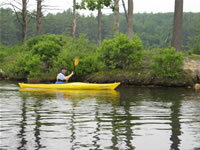 The lake is ideal for canoes and kayaks, which can explore the lake, the Tully River and Long Pond.